Ever since the first television commercial aired in 1941, companies of all sizes and kinds have been utilizing commercials to advertise their products and market their brands. In the late 1980s, brothers Mike and Barry Levy understood the power of a well-produced, unique, attention-grabbing commercial and realized that there weren’t too many professionals in the Las Vegas community producing good ones. And that’s how our company, Levy Production Group (then called Century Productions), got started making commercials for local businesses in the Las Vegas area. Fast forward over 30 years, and Levy Production Group has produced thousands of commercials for a myriad of different clients from all over the world. We take great pride in making high-quality, creative commercials for our clients that they can use on both television and the Internet. Although each individual commercial project is unique, here’s a general overview of the process we take to producing great commercials for our clients. What are the client’s goals for the commercials? Who is their intended audience? What lengths do they want the commercials to be? These are all questions that will be discussed in initial meetings. Some clients come to us with a very specific vision in mind, and others look to our team of creative professionals to brainstorm different commercial ideas for them. We are happy to get started working with the client at any point in the creative process. Once the creative vision has been approved, our talented scriptwriters get to work. Some scripts will have “wall to wall” voiceover, which means there is a voiceover talking throughout the entire duration of the commercial. Other scripts might utilize on-camera talent to speak directly to camera, or talent interacting with one another delivering scripted dialogue. And some scripts have no spoken words at all, but are simply creative visuals, graphics, and music. In any case, script writing (and storyboarding when applicable) is an important step in the pre-production process. You can’t shoot until you know exactly what you need to capture, and you make sure it will fit in the allotted commercial time. Will the commercials utilize paid actors? Some commercials don’t need actors because they feature people who work for the company, real client testimonials, or simply b-roll footage of locations and products without people in it at all. But for any commercials that DO call for actors, casting becomes another important part of the pre-production process. We work with the best talent agencies in the region to ensure that we find all the spokespeople, lead actors, extras and background talent you may need for the project. If desired, we can also hold casting sessions in our studio so that the client can see a wide range of available talent and choose the best actors for the roles. When it comes to shooting locations, some clients want to shoot at their own business, hotel, casino, pool, restaurant, theater, etc. Other clients need to shoot in a studio space over a chromakey green or white or black background. In that case we schedule the project to be shot in our large insert-chromakey production studio at our facility. But some projects require us to find specific locations for the shoot such as a private home, office, warehouse, park, or other locales. Our producers will scout appropriate locations in the desired shooting area and provide photos to the client so they can decide which locations will be the best fit for the project. We make sure that all location fees, permits, and insurance certificates are taken care of in advance so the location is ready for our crews to arrive and get to work on the shoot day. The final step in the pre-production process after talent and locations have been confirmed is to make sure all the necessary props and wardrobe have been purchased or procured and are ready to go for the day of the shoot. Props can include anything from simple items that need to be purchased like coffee cups or backpacks, to larger items that need to be rented for the day like luxury vehicles or poker tables. If there is specific wardrobe or costumes required for the on-camera talent, we also make sure that those items are purchased or rented in the proper sizes for the actors. At this point, a lot of planning and pre-production work has been done so the crew is fully prepared to show up on the shoot day and get to work! Depending on what the project’s needs are, our crews range in size from two-man ENG crews to large crews made up of producer, production coordinator, director, DP, additional cameramen, camera assist, hair and makeup artists, gaffers, grips, teleprompter operator, audio field technicians, technical directors, media managers, and production assistants. The producer ensures that the crew adheres closely to the shoot schedule and captures everything needed on the shot list. Clients are welcome to be on set and be involved as much or a little as they’d like on the shoot day. After all the footage has been captured, the project moves into the post-production phase where it all comes together! The producer works to post-supervise the project to make sure that our editor is using all the best takes captured on set, and that the vision is executed correctly. Our post-production process is often a collaborative effort with our dedicated in-house visual FX artists helping the primary editor with custom motion graphics, animation, compositing, 3D tracking, and color correction as needed. 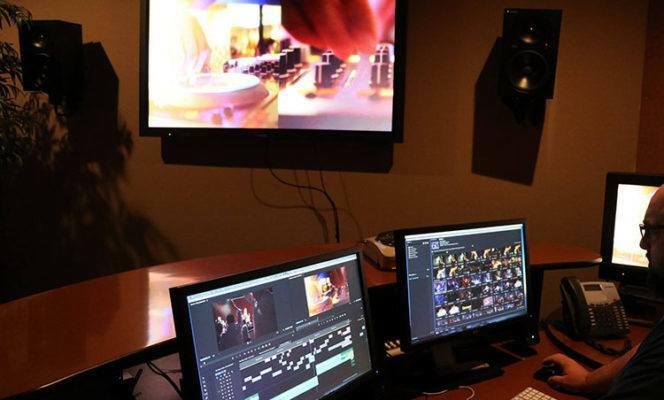 Post-production takes place in one of our six luxurious editing suites at our facility. Clients are welcome to sit in on the edit as much or as little as they’d like to watch and supervise the process. Some parts of the post-audio process need to happen before the video editing. For example, if the commercial needs voiceover then our audio editor will cut the VO with a professional voice talent before the video editing gets started so that the editor has the VO to match the visuals to. Sometimes music cuts can also be selected in advance so that the editor can match video cuts to music beats. However, the remainder of the post-audio work is done after the video editing is complete, with our dedicated in-house audio editor working on the music mix, sound FX, noise reduction, and audio sweetening as necessary. At last, the commercial is complete! We send our clients a private link from a video hosting site to view the finished product. We encourage the client to give us their honest feedback and are happy to make any revisions they would like in order to make sure the project is EXACTLY what they wanted. Our goal is always to exceed our client’s expectations, so we’re not done until that has happened. With the client’s final approval, the project is nearly complete! Sometimes different versions need to be edited from the main commercial. Perhaps the client needs a cut-down version for social media or a whole bunch of additional versions with alternate graphics showing different phone numbers and addresses for different geographic locations. After all versions of the commercial have been completed, all final deliverables and raw media are delivered to the client on a hard drive for them to keep and own in perpetuity. Our media manager is also happy to help upload the commercials to any broadcast servers or FTP hosting sites so the commercials are ready to air! It’s important to keep in mind that no two projects are ever alike, so some of these steps might differ greatly for your own commercial project. If you’d like additional information about our production process or are ready to get started, please reach out to us today!